Files from many of the cameras listed above can no longer be opened using Kodak's own software. 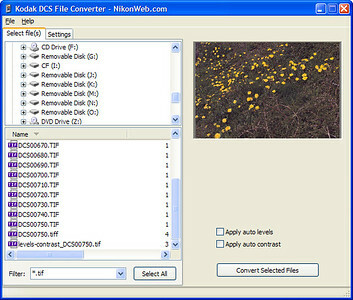 Kodak Photo Desk doesn't support the early camera models, and the DCS file format module doesn't work with Photoshop CS3. If you have any questions, comments or bug reports, please post these in this forum thread (registered users only). This is unsupported, AS-IS software. Use at your own risk. This software is written by Jarle Aasland, and uses Kodak's own DCS support files. See readme.txt for more information. You may freely distribute and share this program, but you cannot charge anything for doing so.